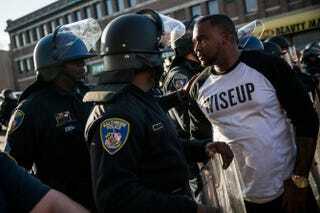 A man talks to police April 28, 2015, near the CVS pharmacy that was set on fire in Baltimore the day during violent unrest following the funeral of Freddie Gray. I’m sure they mean well. The folks soliciting prayers for Baltimore’s “frustrated” juvenile rioters. But I’m tempted to respond to their calls for prayer with a request for prayers for the officers being attacked just for showing up at work. Then I think better of it, because mine isn’t a popular opinion and I’m not in the mood to defend my blackness to anyone, and because clearly I can't be pro-black and pro-law enforcement. But I am. My husband is a 10-year veteran of the Metropolitan Police Department in Washington, D.C., and some of its Civil Disturbance Units were just deployed to Baltimore. So I end up looking at those one-sided pleas and thinking, really? No prayers for the cops out there just trying to protect people’s homes and cars and lives? No prayers for the officers trying to figure out how to give a safe space to those peacefully exercising their constitutional right to demonstrate? No prayers for the law-enforcement officials injured by the rocks, bricks, bottles and flaming trash cans hurled at them simply for doing their jobs? Look, I get it: There’s a historic, deep-seated oppressive and systemic backstory that is the real cause of the generations-deep mistrust of law enforcement in the black community. And I know that police in disproportionately higher numbers kill black men. But when did it become OK to continue the centuries-old practice of valuing some lives over others? Isn’t that, in fact, what we’re angry about? Don’t we want cops to grant us the common decency of agency that we’re now denying them? Now cops’ lives don’t matter? And, yes, I say “we” because I'm a black woman and my husband is a black police officer, and my—our—story isn’t being elevated in the media. Most media also aren’t elevating the photos of the peaceful protests on their front pages or leading their news segments with those images. Nope, just looping video of the looters, those setting fires, those causing havoc and those attacking the very people sworn to protect them. Not all cops are good—true—but they aren’t all bad, either. They have families. They have children. And many of them have black and brown sons at home to whom they will have to relay the stories of Freddie, Trayvon, Mike, Eric, Oscar and the countless others. As an officer’s wife, I know that my husband lives at the intersection of “black lives matter” and “blue lives matter.” In our home, that means simply that all lives matter. Treat everyone with respect. Value everyone’s life. No, I’m not one of those people who believe that officers are never wrong by virtue of their profession. I believe that humans—whether they’re cops, accountants or salesmen—make mistakes and should be held accountable for their actions. I will not, however, accept that there is ever a time when the lives of my husband and his co-workers are expendable because, what, people are angry? There will be those who’ll say, “But did you see those officers throwing rocks at the protesters in Baltimore?” And “Did you read how that Baltimore County officer (not to be confused with Baltimore City, where the protests are) called the protesters ‘animals’”? I’m aware. I don’t condone those actions. They were wrong and there should be repercussions, absolutely. But those actions don't characterize every individual officer on any police force. And they certainly don’t make it OK for anyone to attack law enforcement. The bottom line is this: My husband and his co-workers have as much right as the rest of us to make it home day after day. No matter what the headline du jour might be. Safiya Jafari Simmons is CEO and chief strategist of SJS Consulting, a P.R. consultancy, and founder of the Leap Luncheon Series. Previously she was communications director for the Congressional Black Caucus and press secretary to ranking member Rep. Elijah E. Cummings (D-Md. ).